This pen is Pilot’s response to competitors’ efforts to “get ’em when they’re young”, like the Lamy abc or the Pelikano Jr. 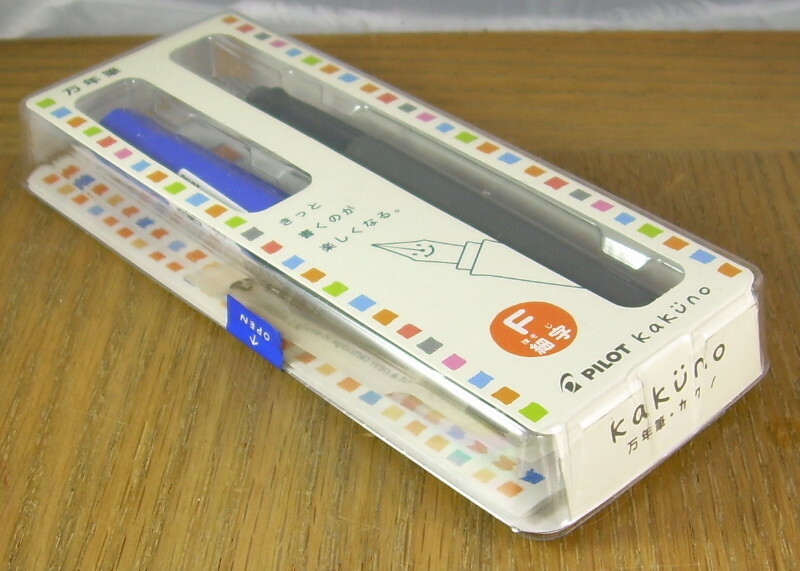 Apparently the name simply means “to write,” if expressed 書くの, although on the box it appears as カクノ using the Katakana script associated with neologisms and foreign words (this is also relatively common with trade names; Toyota is regularly written in Katakana). The design is meant to appeal to a young user, with rounded corners and bright colours. The point and feed are essentially the same as those used in the Metropolitan, but in keeping with the kid-friendly theme the decoration on the back of the point is a smiley face; in some colour schemes, this face is winking. Apart from the lack of a clip, something fairly common in this particular slice of the market, there’s little to say against the Kakuno. The cap can actually be posted during writing, something strangely absent from many other tykes’ pens. The shape of pen and cap, both of hexagonal cross-section, prevent it rolling too madly, and the cap has a little stop-tab molded onto it as an extra insurance against the pen leaping to the floor. The section is ergonomically molded, but in more of an advisory manner than one sees in the German competition. If I were to say anything against this pen, it would be in connection with the relative difficulty of getting replacement cartridges; this problem is somewhat regional, of course. Production Run: I’m a little unclear on when it was introduced; 2013 or 2014. Cost When New: ¥1000, according to the box. Size: 13.2 cm long capped, 16.0 cm posted, 12.8 cm uncapped. Filler: Cartridge , capacity approx. 0.8 ml; I haven’t tried it, but I see no reason the CON-20 press-bar type (0.7ml) and the CON-50 piston type (0.5 ml) converters shouldn’t work (updates will occur if experiments prove otherwise). The extremely amiable Pilot Kakuno, in one of the more adult-tolerable colour patterns. I like the packaging a lot more on this pen than on the Pelikan or Lamy contenders in the field.